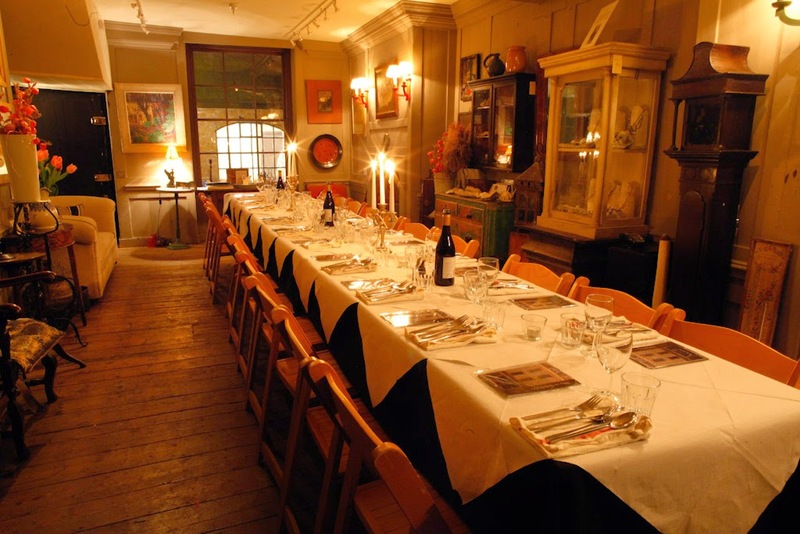 The Disappearing Dining Club, who run the 'Back in 5 Minutes' secret restaurant on Brick Lane, are holding dinners twice a month in a restored 18th century house in Fournier Street. Dinners take place on the second and fourth Friday of each month, and note that the space is also available for private hire. "Town House is a beautiful 18th century weaver’s house on Fournier Street, opposite Hawksmoor’s Christ Church in Spitalfields. The building has been a doctor’s surgery, a furrier, coffee rooms and storage for the vegetable market, until at the end of the Second World War it became the Market Cafe, which closed in 2000. It’s now an antiques shop, gallery, café, and has rooms above for weekends of East London shopping. Dinner is a welcome cocktail, three courses and half a bottle of wine per guest. Dishes are served supper club style, to be shared by friends and strangers, surrounded by antique furniture and upholstery, old china, glasses, serving dishes, jewellery and colourful modern pottery."